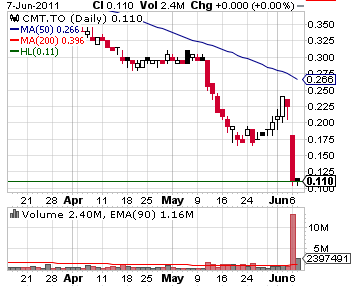 Traders of Compton Petroleum Corporation (TSE:CMT) (PINK:CMZPF) embraced the recent massive share price collapse and seem unwilling to call it a bottom - the price action has shown little affection towards a possible correction. CMT stock stayed down throughout Tuesday, still unable to recover from the nearly 50% collapse that occurred during the first trading session of the week. The stock hit a new multi-year low and currently trades at 11 cents - roughly 100 times lower than three years ago. The sell-off was a reaction to the first quarter results, which were published on the same day, June 6, 2011, before the trading session. The company's performance was impacted by lower natural gas price and it fell directly on their top line, worsening the situation that was already questionable due to other management decisions. •	Q1 profit was $2.5 million, or ten times lower than over the same quarter last year. The management stated they will attempt to focus more on the liquids-rich areas and oil opportunities since the natural gas business is slowing down.